Remember how this was used as proof that arctic sea ice had recovered, despite the fact that sea ice volume has continued to decline. Why? Well its obvious isn’t it the blue line which represents this years sea ice extent (not volume, which is a better indicator of sea ice health and has continued to decline) is no longer playing along with their lie. It is now lower (but only just) than the line representing 2007, which was the year with the lowest sea ice extent ever recorded. 2006 was well below 2007 at this point, and turned out to be uninteresting. As far as I know, no-one believes in predicting the minimum (which, of course, is the only number anyone gives a toss about) based on previous months. So what is going to happen to the ice this summer? That is anyone’s guess, but a recovery of the sea ice is not likely, despite what deniers claim. See the line leading to the little box? 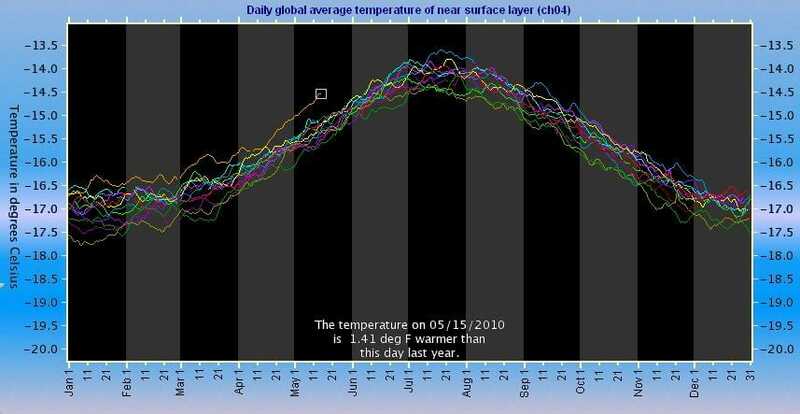 That is this years temperatures. Can you imagine the howls of global cooling if that line was as far bellow the others as it is high? Hell, even with this year being so warm deniers are still claiming that global cooling has begun. That is denialism pure and simple.